An astonishing site captivating your imagination, preserving the heirloom, culture and traditions of Sanchi with its artful decor of Buddhist art and picturesque view making the place look spectacular amidst the gracious landscape. Offering the world class hospitality and services along with unique holiday opportunities for guests coming from all over the world for visiting Sanchi. We Build a strong relationship with our guest making their stays comfortable and make them visit sanchi again in the near future. We stive for making this vision a reality. The Aaram Baagh derived from "Garden of Rest" or "Pleasure Garden", which was associated with former Maharajas or Royal Families in the gist that it was used for relaxing and keeping off from Royal duties by the former Rajas and Maharajas with their Maharanis during the princely era. At times to keep off from royal duties, the erstwhile Maharajas along with their Ranis use to visit outskirts of the town to spend time alone in a peaceful place for relaxation, recreation and enjoyment, which was said to be Aaram Baagh. Aaram Baagh Sanchi earlier known as Kachnariya Kothi . This Kothi was made in 1902 by Nawab of Bhopal. Nawab invited one of the British Vice Roy to come and have the pleasure of hunting. 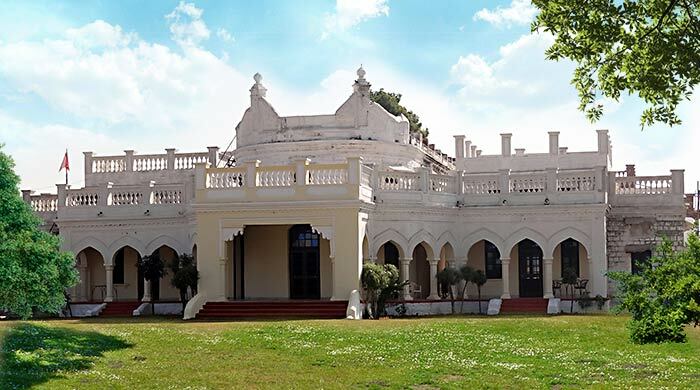 In Aaram Baagh Sanchi, the bygone era royal families use to relish natural beauties, beautiful surroundings, thrilling view of lush green garden, sun rise & sun set in royal comfort. With this back drop Pachar group has come up with Aaram Baagh in Sanchi. The Group offers the guests, who prefer to bask in the royal charm of Indian Maharajas and Maharani's, which not only symbolize comfort and luxury but also reflects upon Royal Style of living. Though times have changed and winds have shifted Aaram Baagh Sanchi brings royal style, the kind only the Maharajas and Maharanis of yesteryears could have relished and enjoyed. Aaram baagh Sanchi offers you three luxurious suits Maharaja, Maharani and Rajkumar to relish the begone era of royal living. The scenic view of Aaram Baagh Sanchi changes every hour from dawn to dusk and the wonderful clear celestial starry night makes one feel nearer to heaven. The luxurious suites are an amalgamation of personal house and luxury lodge.